Newly uncovered documents reveal that Google may be considering launching Wi-Fi networks in cities that get Google Fiber. Google has approached 34 different cities about the possibility of installing Google Fiber next year, and according to Computer World the company is discussing Wi-Fi networks with these municipalities as well. The site obtained documents sent to cities that say Google will be "discussing [its] Wi-Fi plans and related requirements with your city as we move forward with your city during this planning process." That's as descriptive as the documents get, so it seems Google's plans may be vague, even internally. 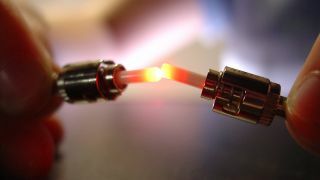 The company did send out a statement, saying, "We'd love to be able to bring Wi-Fi access to all of our Fiber cities, but we don't have any specific plans to announce right now." The 34 cities being considered currently include Phoenix, San Jose and Mountain View, Calif., Atlanta, Portland, Ore., Salt Lake City and others. But not all these cities will make the cut, and to be considered it seems they must go through a rigorous application process. Google has reportedly asked these cities for lists of all addresses with descriptions of building types, a huge range of data on everything from pavement conditions to locations of utility poles, and possible locations where Google might set up 12- by 30-foot "utility huts." "This process will take some time, but we hope to have updates on which cities will get Fiber by the end of the year," Google says in the document. Will your city be next to get Google's ultra-high-speed fiber internet (and maybe even Wi-Fi)? One can certainly hope.